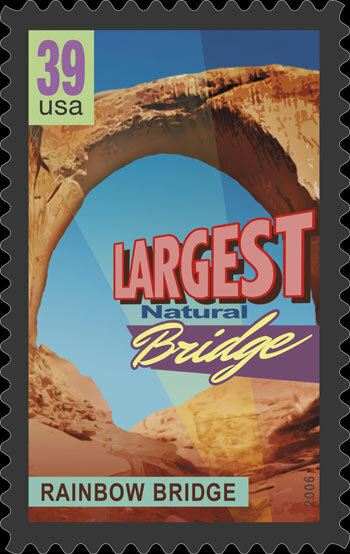 feet high and spanning 275 feet, is one of 40 new postage stamps titled "Wonders of America," which depict the most remarkable places, structures, plants and animals in America. Stamp subjects range from the loudest animal, to the oldest trees, to the deepest lake. The stamps debuted May 27 at post offices nationwide. simply getting to this remote national park site � whether it is boating across Lake Powell or hiking in � is all part of the adventure," said Kitty Roberts, National Park Service superintendent of Rainbow Bridge National Monument and Glen Canyon National Recreation Area. "We are delighted that the U.S. Postal Service is once again highlighting America�s national parks on postage stamps." Largest Mountain Chain: Rocky Mountains, and Largest Plant: Quaking Aspen. The Wonders of America Stamps can be viewed at USPS.com by clicking on "stamp preview." of [the Southwest]," said USPS District Manager Ken McArthur. "Two months ago it was Bryce Canyon; now it�s Rainbow Bridge." superlative nature of a particular place or thing. Smaller type gives the name or location of the featured wonder. Text on the back of each stamp provides relevant statistics and other interesting information. Rainbow Bridge is in southern Utah. It is 275 feet across and 290 feet tall. This sandstone wonder holds spiritual significance for various American Indian groups and was designated a national monument in 1910 by President Taft." Antiquities Act. Passed by Congress in 1906, this law is a hallmark of American conservation and is celebrating its 100th anniversary this year. first established using the Antiquities Act. Today, Rainbow Bridge receives 100,000 annual visitors, most of whom arrive by boat from Lake Powell, a part of Glen Canyon National Recreation Area. covers, Digital Color Postmarks, post cards, and posters, will be available, while supplies last, at postal stores, online at USPS.com/shop, and by phone at 1-800-STAMP-24 (1-800-782-6724).